Please do NOT message me on Youtube about bugs with the mod or the website or with questions about the mod! I respond to almost all comments on this post, and if you have a question or bug report, it can go here. Select the version you want from the side bar on left of new page. navigate to your .minecraft folder. move the zip folder into the mods folder. extract the rar file to retrieve the files inside, those are the actual mods. move the zip folders into the mods folder. I AM NOT RESPONSIBLE FOR WORLD CORRUPTION RESULTING FROM THIS UPDATE! - Add Incubator as an intermediate part of getting the resources. 1) Message me letting me know you are using it in your pack, I like to know where my mod(s) is /are being used. 2) You MUST give credit to ALL mod makers of the mods you use. I don't care if they say you don't have to, it is all about giving credit where credit is due. 3) If the pack is public, I would like a link to the pack download so I can check it out. Requirement 2 is the most important on this list, I reserve the right to request the removal of my mod(s) if you do not comply with this list, or I feel the mod(s) is/are being used in an inappropriate manner. Please vist http://www.saxon564.com/mods/MoChickens to get all the information about the chickens and items before asking how to tame one of the chickens. This forum will be updated with the downloads and display what each update contained, but the images and information will not update with the mod any more. 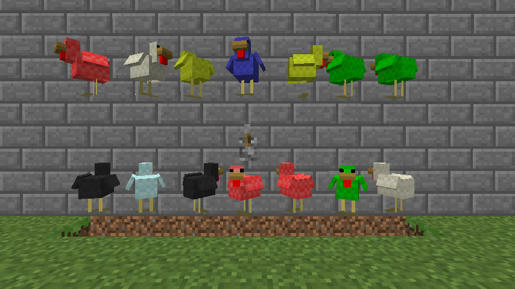 If you would like to help with this mod I am looking for some suggestions on how to balance the chickens a bit better and ideas for new chickens, please just post them here and I will take a look at them. Disclaimer:I am NOT responsible for the mod causing your Minecraft to crash after removal of the mod. If the mod crashes your Minecraft while installed please put a copy of the error report here. Creator of the Mo' Chickens mod! So many chickens, so much death! Thanks for your sugestion MutantEnderCreeper. I was actually thinking about that, but im not sure if its really something that should be in this mod. I will keep thinking about it and maybe i will add it. Please describe this epic chicken. In fact, I will use this a lot. I have always loved chickens. Actually i like those ideas, though one of them i was already planning on adding. I will definately add them in the next update. I like the ideal man gj. Thanks for the mod review, i realize some of the chickens are a little OP, such as the redstone chicken can hit you once and bring you down to 1.5 hearts after the fire, but i didnt know the iron chicken would bring you down to half a heart. so im looking for suggestions on how to balance them a bit more. i will put the video on the front. thanks! 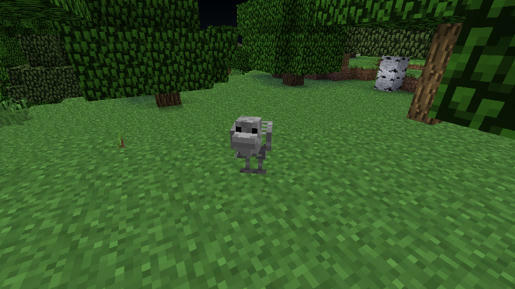 im thinking about turning this into a line of mods for each mob if this goes over well. I was thinkings the opposite, i think the redstone chicken and the iron chicken are to strong, while the diamond chicken isnt strong enough for its kind. Enjoyable mod, especially for people who aren't big on mining. Thanks for the review! i have added it to the front. 1) I like several of your ideas, you have given so many of them i will have to take some time to figure out which ones to add before the others. 2) nether fortresses do spawn in a specific biome, in the code the nether is the biome "Hell"
3) I literally just searched redstone on google images and found this, i can tell it was from some sort of clothing just by the texture of the colors, but i do not know what it really is from. 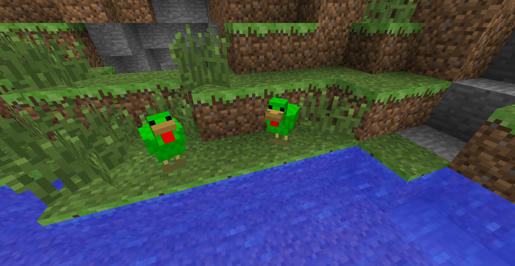 Creeper chicken: lays gunpowder/ exploding eggs, explodes if provoked. Chicken hormones: (Recipe varies with chickens. ): makes chickens grow so that they will lay items less often, but it will be in it's block form. Thanks. I thought that it was implied that Nether Fortress spawn in Hell biomes, witch huts in Swamp biomes, Jungle temples in Jungle biomes, and Desert temples in desert biomes. What I meant was that strongholds do not spawn in any one biome, and can spawn in any biome in the overworld dimension. 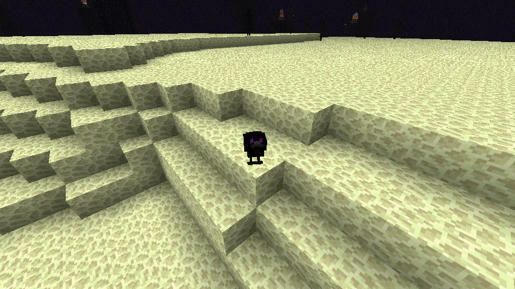 Thus, they might not use that hook that lets wither skeletons, blazes, and witches spawn, as those are all biome based. As an example, if a desert temple or a jungle temple occured partly in a swamp, only witches could spawn in the swamp parts, as well as not only witches in other biomes like rivers for witch huts. Do you understand now? Most people try to look for double or triple or quadruple witch huts, but they really should be looking for jungle or desert temples that occur mostly in a swamp biome, due to the huge area for spawns compared to the size of witch huts. Anyway, the point is that it might be a bit more difficult for coding the Artifactory Chicken's area to spawn, if ever done. And yeah, that's the logo from a Jynx shirt, I think. whoops, my thinking was off, for some reason i was thinking you were saying that nether fortresses do not spawn in a specific biome. Blazing chicken is a new one that i had not thought of, i will consider adding that. Creeper Chicken i was thinking about that earlier today, and would like to add that at some point. 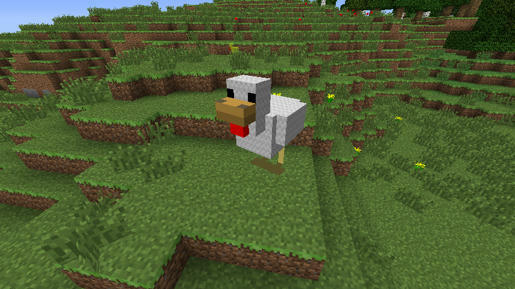 Chicken Hormones im not too sure about, it would add a neat aspect to the mod but im not sure that it would really go along with what this mod is about, i will consider it though. 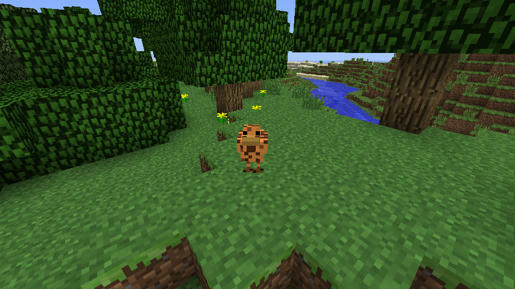 As for other suggestions that anyone else may have in the future, i am thinking that it would be cool to have it hook into other mods with other ores as well, such as IC2 or BC, and add chickens for their ores, if it finds that the mod is installed, what do you guys think, and what other mods should i make it compatable with? and just a small little update, at the time of this reply, i have been working on making the texture and a new model for the skeleton chicken, the model is because some of the textures run together using the current model so there would be inconsistancies with any chicken where one texture cannot fit on more than one side. 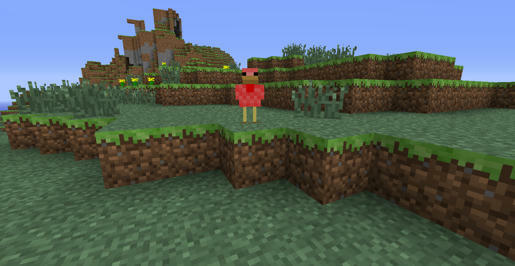 I've just about finished the skeleton chicken, just a few bugs to work out, then its on to the ender chicken. Thanks for all your support and suggestions, i really didn't expect to get as many suggestions as I have already gotten, many of which i would never have though of. Thank you all so much! I will see you all tomorrow, ready to maybe see more suggestions, and get back to working on making more chickens for everyone to enjoy!